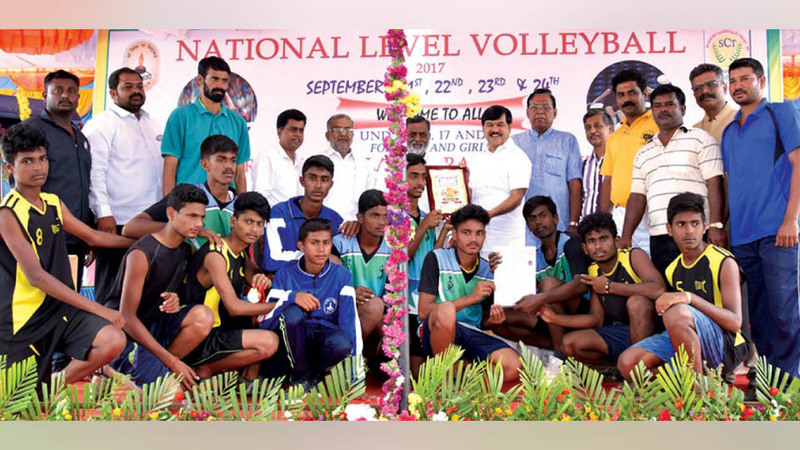 Hunsur: Shastri School Boys Volleyball team, representing Karnataka, emerged champions in the U-17 category in the National-level Volleyball Championship jointly organised by Vidyabharati Shiksha Sansthan and Shastri Educational Institutions, Hunsur, here recently. In the final, the Karnataka team defeated Maharashtra 3-1 to emerge as the champions. West UP team emerged third in the tournament. In the U-19 category, B.V.K. College of Vishakapatnam won the final match defeating Tamil Nadu 3-0. They were followed by West UP in third place. In the U-14 category, West UP team defeated East UP 3-1 to emerge victorious and Team Mangaluru was placed third. In the girls category, Tamil Nadu defeated West UP 3-0 to emerge champions in the girls U-19 category. In the U-17 category, Maharashtra defeated Vivekananda Kannanda School, Puttur, 3-1 to emerge as champions and Tamil Nadu team won third place. In the girls U-14 category, Maharashtra won the first place defeating Bengaluru 3-0. Tamil Nadu was restricted to third place. MLA G.T. Devegowda, former Minister S.A. Ramdas gave away the awards to winning teams. Vidyabharathi Khel Convenor Kishore Chauhan, Co-convenor Alok Chaudary, Krishnashankar Sharma, Sports Officer Ananda Shetty and others were present.